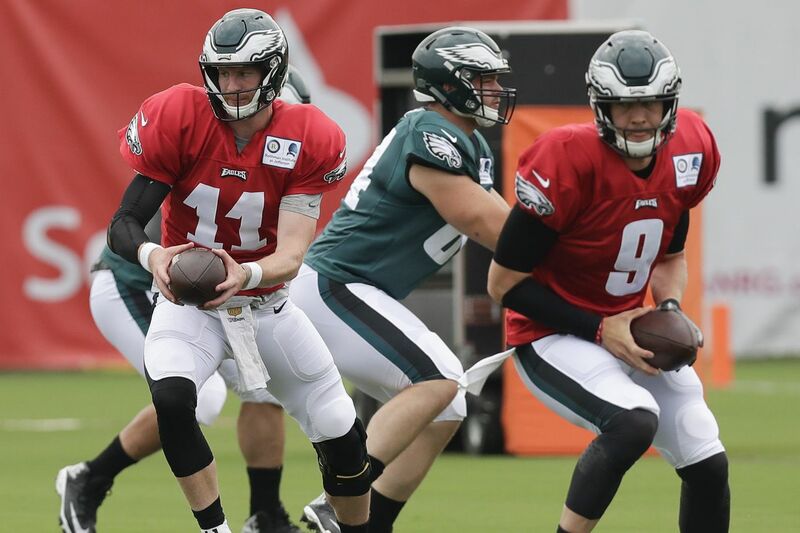 The Carson Wentz Rehab Train scaled another peak as the quarterback participated in 11-on-11 drills during the Eagles' first padded practice. He hasn't been cleared for contact – the last hurdle he must clear – but that step can't come until the first preseason game. For now, Wentz is doing almost as much as any Eagles quarterback and the rehab breaks he was given during spring workouts are no longer a requirement. There are risks with allowing Wentz to practice during team drills. He's off limits in terms of contact – as are all the quarterbacks – but anything can happen with 300-pound lineman pounding flesh in his proximity. For instance, Wentz nearly got sandwiched between defensive tackle Elijah Qualls and defensive end Josh Sweat. Fans collectively gasped. "I had the guard's arm hooked and I was pressing in towards [Wentz]," Qualls said. "But as soon as I saw the red jersey, I dropped down on my knee." A few moments later, in between sets, Pederson gathered the defensive line. But his message wasn't to ease up when the franchise quarterback is under center. "Obviously, I know we need Wentz," Qualls said. 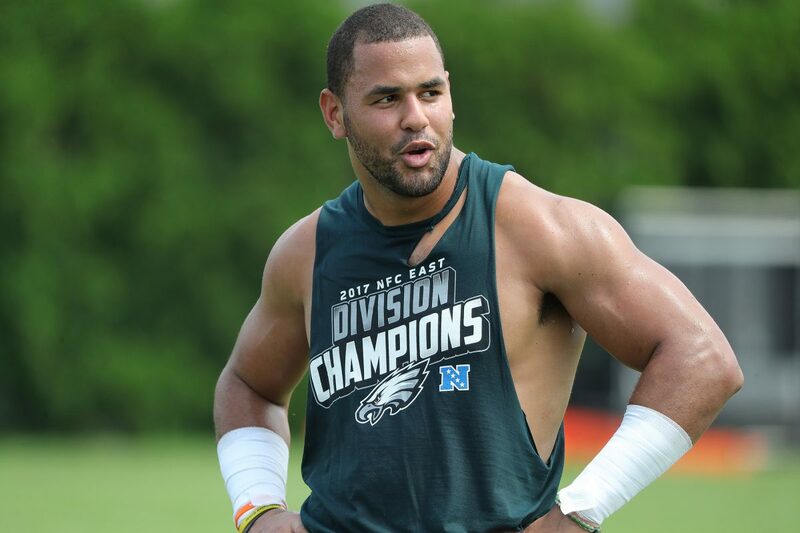 "But at the same time, I know that [Pederson] doesn't want us to not play. We got to get better, too. Just be smart around the quarterback." Wentz wasn't exactly sharp with his early throws – he once threw an interception into the waiting arms of cornerback Jalen Mills– but he moved effortlessly in and outside the pocket. If he was testing how his surgically repaired left knee would respond to cutting and lateral movement, he apparently passed with flying colors. On Wentz's first two drops, defensive end Michael Bennett applied pressure – the first was technically a "sack" – but the quarterback effortlessly accelerated away each time. His first set came with the second unit, but Wentz was with the starters a series later and he connected with receiver Nelson Agholor after he rolled out on a naked bootleg. Wentz had his best toss later in practice. He roped a 25-yard dart to receiver Shelton Gibson in a hole down the sideline. After practice, I asked Wentz if he had to be cleared by the medical staff before 11-on-11 full-pad drills. "Did 11-on-11's the other day," he said. But those were non-contact and in shorts and shells. Wentz shrugged. Looks like you could play a game tomorrow if need be. Wentz just shrugged again. Unless I'm missing something, it's hard to imagine him not being ready, barring a setback, by the season opener on Sept. 6. With pads comes hitting, and the first "pop" of practice came courtesy of linebacker Corey Nelson, who squared up running back Matt Jones during run drills. There will be a few tackling-to-the-ground periods next week, but the Eagles will mostly limit contact to "thud" hitting. That doesn't always stop the overzealous from pushing the boundaries. Linebacker LaRoy Reynolds gave receiver Rashard Davis a little extra business after a catch over the middle. Reynolds has shot to the top of my list of Players Most Likely to Get Into a Fight in Camp. Agholor caught a screen pass from quarterback Nick Foles and safety Malcolm Jenkins came up a gave the receiver a little shot to the side. Agholor didn't appear to like it. A year ago, Jenkins made Agholor his pet camp project and challenged the then-new slot receiver. Jordan Hicks took some first-team snaps at weakside linebacker with Joe Walker in the middle. The Eagles will try all sorts of looks throughout camp, but Hicks' move outside, however brief, is noteworthy. He can play all three spots, but bumping Walker up could suggest that defensive coordinator Jim Schwartz is looking for options in case the three main candidates for the weakside linebacker spot aren't cutting it. Nelson, Kamu Grugier-Hill, and Nate Gerry split reps there during team drills. Gerry was first up and during his early set he blitzed off the edge and forced Foles to dump wide of the releasing Darren Sproles. Cornerback Sidney Jones was back in the slot with the first unit. De'Vante Bausby has been the only other corner to see time inside with the starters thus far. Kamu Grugier-Hill split reps at weakside linebacker with Nate Gerry on Saturday. Getting the pads on also allows for a more nuanced look at linemen. I paid attention to the Eagles' two rookie offensive lineman – Matt Pryor and Jordan Mailata. Pryor has been working primarily at second-team right guard and he even took a few reps with the first unit when Brandon Brooks took a breather. Mailata has been the third-string left tackle. They're playing different positions, but Pryor appears to be significantly ahead of Mailata, which isn't a surprise. Mailata, a former rugby player, has never played in an actual (American) football game. Pryor held his own during one-on-one drills. Sweat easily got around Mailata on one rush and the tackle was fooled by a Joe Ostman spin move on another. Tackle Taylor Hart bottled up Bennett during one-on-ones, but he had trouble containing the veteran end during multiple team drill rushes. Josh Adams missed all of spring workouts with a foot injury, but the running back has practiced full in camp. The Notre Dame product is long at 6-foot-2, and that often causes him to run too upright. But he kept his legs churning when defensive tackle Bruce Hector stood him up near the line during run drills. Adams received the highest signing bonus among undrafted rookies in the NFL, so the Eagles must have seen something they really liked. The competition for the fourth running back spot – if the Eagles keep that many – is deep with Adams, Jones, Wendell Smallwood, and Donnel Pumphrey all seemingly capable of claiming that spot. Pumphrey hasn't stood out yet. Eagles cornerback Jalen Mills points during training camp on Saturday. A running diary of team drills, with the first unit: Defensive tackle Fletcher Cox slanted past center Jason Kelce and blew up running back Corey Clement in the backfield. Wentz would later get Cox to jump offside with his hard count. Agholor took an end-around, but was met by cornerback Ronald Darby. Pryor, filling in for Brooks, was whistled for a false start. Defensive tackle Destiny Vaeao patted his helmet as if to say, "We know it was you!" Foles completed three straight passes, but each was of the check-down variety. Sproles shot through a gaping hole and motored upfield. Does this guy ever age? The second unit: Gibson, who left practice yesterday with cramping, dropped a pass over the middle from quarterback Nate Sudfeld. Center Isaac Seumalo sailed a snap over Sudfeld's head. He does this far too often. Wentz dodged an edge rusher, turned his body, and flicked a pass to Jones. Sweat jumped offside. And the third unit: Not much notable, but receiver Markus Wheaton had a downfield block on cornerback Rasul Douglas during a Jones dash that drew the vocal admiration of offensive coordinator Mike Groh. And some leftovers … Before practice, Darby and new receivers coach Gunter Brewer stood opposite each other and tossed two tennis balls back and forth to work on the cornerback's eye-hand coordination. … After warm-ups, Mills ran over to a young fan wearing his No. 31 jersey, shook his hand, and posed for a picture. … Punter Cameron Johnston was inconsistent again. By my calculations his kicks went: short wobble, boomer, meh, angled, hang time super short, OK, shank, decent, hang time short, yuck, decent, end-over-end, what the hell was that?, good, and not bad. Johnston slapped his hands together at the conclusion, clearly not pleased.